Lawless tells the true story of bootlegging moonshine in Depression era Franklin County Virginia. The Bondurant family had perfected the business almost to a science with everyone partaking in the illegal booze; police, politicians and the townspeople in the entire area. That is until the Governor of Virginia sent in a special deputy named Charlie Rakes (Guy Pearce) whose viciousness was perfected as much as the Bondurant's business. The Bondurants are three brothers Jack (Shia LeBeouf), Forrest (Tom Hardy) and Howard (Jason Clarke). Jack is the youngest and he is still pretty naive to the evil that lurks out in the world but he desperately wants to prove to his brothers that he can be a part of the business and do it well. Howard is the least intelligent of the three (probably from too much of what he sells), and he spends most of his time with Forrest as additional security or in a drunken stupor with the ladies of the night. Forrest is the most sullen of the three. A World War I vet who had nine lives and was the sole survivor of his platoon. Every form of death has hit Forrest and he was still standing, although he has become very cold. He seems almost incapable of being close to anyone, even the new waitress he hires played well by Jessica Chastain. Forrest has a low throaty, gutteral way of communicating but when Special Agent Rakes gets introduced, Forrest knows this guy ain't going away. The Bondurants refuse to knuckle under when Rakes and the law try to muscle in on the boy's profits and a war ensues. The script for Lawless was based on the book "The Wettest County In The World" by Matt Bondurant (the great grandson, if I am not mistaken). The script, written by the multi talented film score composer, writer Nick Cave does a good job of getting into the personalities of the Bondurant boys and Special Agent Rakes. They are at loggerheads and there is no give on either side. Guy Pearce, who actually plucked his own eyebrows out for the character of Rakes, gives one of his best performances. He is a foppish thug who dresses impeccably and swims in extravagant cologne. He likes his women but he likes himself more and looking good is his way of life. Shia LeBeouf is a fine actor and he does a good job of being the youngest who quickly realizes that maybe he not cut out for this way of life as he begins to feel the pangs of love for the first time with the local preacher's daughter. Jason Clarke is effective as Howard; a blunt instrument of destruction that you would want backing you up in a clutch situation. Let's put it this way....you don't want to be on Howard's bad side. 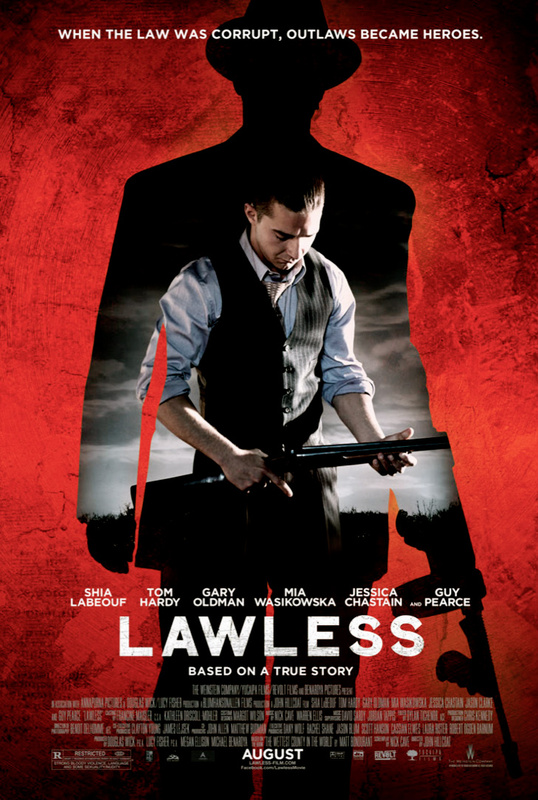 Lawless is an efficient, almost flawless film; well written and acted. It is also efficiently helmed by John Hillcoat who previously directed Guy Pearce in the under appreciated The Proposition and Viggo Mortensen in The Road (Pearce also had a tiny cameo in that film, as well). Hillcoat's direction coupled with Cave's script gets into each character and lets them grow in our psyche. I cared what happened to them and it was fascinating to see not only their interaction amongst themselves and they all play off of each other quite well. The acting is flawless and there is even Gary Oldman thrown in for an added bonus as infamous gangster Floyd Banner. Lawless has some action in it but it not action just for action's sake. It flows out of the story, the characters and the time in which it takes place. Now if you don't mind... I am going to have a drink.